The Mitraclip procedure for mitral regurgitation is performed on a leaky mitral valve. This article presents a broad overview of the procedure and the people who need it. For a detailed overview of the MitraClip procedure itself, please see our article How to do the MitraClip Procedure – A Complete Guide. A leaking mitral valve can be seen in the image below. The blue jet shows the leak, and represents blood leaking backwards – from the bottom to the top chamber of the heart – through mitral valve. The medical term for the leaky mitral valve is mitral regurgitation. The Mitraclip is a new treatment for severe mitral regurgitation that does not require open-heart surgery. The Mitraclip procedure is performed through a small incision in the groin unlike usual mitral valve surgery that requires sawing open of the breastbone. A tube is passed up through the leg vessels to the right side of the heart and the tube then passed in to the left side of the heart using a technique known as trans-septal puncture as seen below. This is a very specialized technique and gives us access to the mitral valve. The Mitraclip is then passed up through this tube and in to the left side of the heart, connected to a delivery system. The delivery system is an instrument that remains outside the body and allows us to control the delivery of the Mitraclip. It is very important care is taken ensure no air bubbles get in to the heart. The blood is kept thin using a blood thinner called heparin to ensure no clots form on the delivery system. The Mitraclip is then positioned over the leaky mitral valve and using the delivery system, small adjustments are made to ensure the clip is in the desired position. The arms of the clip can be opened and closed, and the clip can be turned clockwise or counterclockwise as required. This is shown below. With the arms opened, the Mitraclip is passed down below the mitral valve. After further positioning the Mitraclip pulled back upwards and the mitral leaflets are grasped. The clips are then closed and the valve reassessed to ensure that there is a reduction in the mitral regurgitation. If there is not the desired reduction in the mitral regurgitation then the Mitraclip may need to undergo further repositioning before it is released. The arms of the Mitraclip are then closed and the Mitraclip secured into position. The Mitraclip is then detached from the delivery system. The delivery system is then withdrawn. The Mitraclip remains firmly attached to the mitral valve leaflets. With correct positioning of the Mitraclip, the mitral regurgitation is reduced to minimal levels and the procedure successfully completed. In many cases, one Mitraclip isn’t enough and a second, or even third Mitraclip will need to be deployed to achieve the desired result. The Mitraclip remains securely in position tightly bound to the mitral valve leaflets. Most of the proven benefits of reduction of severity of mitral regurgitation by the Mitraclip are quality of life and not length of life. This is likely because the follow up time from experience with the Mitraclip is still in its early years. All in all the Mitraclip procedure can be considered safe as determined by experience from use of thousands of devices. The chance of procedural success is >90%, and the chance of surviving the procedure is >99%. As with any invasive procedure, even minimally invasive there are risks associated however. It’s why you want a truly expert team guiding the procedure. Even though the tube inserted in to the leg for the Mitraclip is not a surgical incision, there is still a small risk of damage to the blood vessels or infection at the entry site. As with anytime working inside the heart, there is chance of damage to cardiac structures including the valves, the vessels, or the walls of the heart. There is a chance of leakage of blood outside the walls of the heart that may require further procedures to take care of it. There is a small chance of clot developing on the tubes in the heart or air getting in to the heart, the consequence of which could be a stroke amongst other complications. Care is taken to minimize this. There is a chance that the hole made to travel from the right to the left of the heart, doesn’t close on its own and leaves a persistent defect. Rarely this may need to be closed with another procedure. What Kind of Doctor Performs The MitraClip Procedure? An interventional cardiologist that specializes in structural heart disease performs the Mitraclip procedure. A heart team approach is required for Mitraclip patient selection and consists of an interventional structural cardiologist, a cardiac surgeon, and a cardiologist specializing in imaging and valvular heart disease. During the procedure itself the imaging specialist is key, as pictures need to be obtained and interpreted in a 3-Dimensional fashion. It is important that the interventional cardiologist performing the procedure is well trained in imaging also. I know I had a large advantage when starting this procedure because I had advanced understanding of both imaging and structural intervention, allowing an immediate understanding of working in the heart in 3-dimensions. How Long Does The Mitraclip Procedure Take? The whole process has 3 steps: the pre-procedure, the procedure, and post-procedure recovery. Most patients will have been assessed in clinic to assess suitability for the Mitraclip procedure. Patients arrive on the morning of the procedure. Some basic lab tests are done and the patient will meet the anesthesiologist. In the procedure room, the patient will be put to sleep for the procedure and a breathing tube inserted. This will usually be taken out as soon as the procedure is done. In experienced centers, the procedure itself can take from 1 to 3 hours. Sometimes it can be longer if required depending on the complexity of the case. After the procedure the patient will go to a recovery area and when felt to be stable enough, sent to a room in the hospital. I usually send patients home the next day in the early afternoon. Am I Eligible to Have a MitraClip Procedure? Across the world there has been considerable experience with the Mitraclip, particularly in Europe. 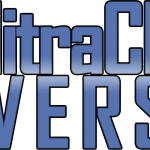 Thousands of Mitraclips have been implanted. There is growing experience in the US with the Mitraclip, however the indications for use in the US are more restrictive. The reason for this is that the FDA requires further high quality evidence before the indications are widened. As of now, in the US, the Mitraclip is only approved for severe degenerative mitral regurgitation. Severe mitral regurgitation that is primary in nature. This means the primary problem is with the valve itself (i.e. mitral valve prolapse, a problem with the valve leaflets themselves) as opposed to secondary mitral regurgitation (i.e. severely enlarged heart causing the valve problem). The patient is considered to be at too high risk for normal mitral valve surgery. A specialist heart team that includes a surgeon experienced in mitral valve surgery and a cardiologist that is experienced in the management of valvular heart disease and the Mitraclip has assessed the case. What Patients Should Not Have the Mitraclip? Patients at high risk of bleeding, and who will not be able to tolerate the blood thinning medicines given at the time of the procedure and those required after the procedure. Patients determined to have rheumatic heart disease, and are therefore at risk of developing an overly tight mitral valve if the Mitraclip is used. Patients that have clot inside the heart, or inside the vessels through which the Mitraclip is delivered to the heart. These judgments of high risk are determined by cardiologists who specialize in valvular heart disease and the Mitraclip, together with a cardiac surgeon that is experienced in mitral valve surgery. Patients who have a calculated 30 day risk of death of >8% for surgical mitral valve replacement of >6% for surgical mitral valve repair. Patients with prohibitive anatomy for surgery such as porcelain aorta that would make conventional surgery too high risk. Other circumstances that would make surgery inadvisable such as dementia, right sided heart dysfunction, chronic illness etc. My partner had the Mitral clipping done on January 27th 2016. My question is how soon is it recommended to be able to fly for approxmently for 4 hours ??? That would be up to your treating doctors as they are familiar with your overall situation, in most cases unless there are any other issues going on my patients would be free to fly almost immediately in the days after the procedure, all going well. You would be asleep for the duration of the mitraclip. I am a 38 yr old with mitral valve prolapse with severe MR. How often are you doing these procedures in younger patients? When you have this procedure do you have to be on life long anticoagulation? The younger patients i usually do are those that are considered at high risk of open surgery. Lifelong anticoagulation is not required after mitraclip. I have Multiple Myeloma, Atrial Fibrilation, High Blood Pressure and a Brain Tumor. Lately, after a echocardiogram was taken, it showed that I have two heart leaking valves, Mitral and Tricuspid. Am I at risk for a Mitral Clip procedure. I have been told I could not have open heart surgery. The mitraclip is currently used for those who are at risk for conventional surgery, and from first glance it would appear you are. Currently the clip is restricted to those with a degenerative form of mitral regurgitation. The echocardiogram would have to be reviewed carefully to see if this was the case. We have certainly noticed excellent results with the clip, a good safety profile, and a good reduction in the amount of mitral regurgitation. Patients have tolerated the procedure well, in fact i typically send the patients home the next morning. If I have the Mitraclip procedure done, will I have to take blood thinners or any other medicines continuously? Most people are on aspirin lifelong. I use a blood thinner such as plavix for 1-3 months. If people are already on a blood thinning medication such as coumadin, eliquis, xarelto etc, then i will not give the plavix. My mother recently had two mitraclips deployed. She was on eliquis and then given plavix after the procedure. She was 90 strong and rallied after the procedure. After taking plavix in addition to eliquis for 4 days, she awoke on day 5 and had a massive bleed out on the brain. Why would this team of surgeons prescribe both thinners when you recommend one? She passed away from the bleed out. So sorry to hear that. Im not sure, i suggest you ask them for clarification as i suspect they were started for another reason such as atrial fibrillation or other. In terms of the clip itself, its felt important that aspirin is taken, but unless there are other indications there are not strong recommendations for other medications. Hello Dr Ahmed, I have severe mitral regurgitation & have had radiation to my chest- right sided breast cancer, 7 years ago. I’m asymptomatic & otherwise pretty healthy…could I be a candidate for the mitraclip? Depends on a number of factors. Firstly its important, particularly given that you are asymptomatic that the diagnosis is made correctly and that you do have severe MR. In general the Mitraclip is reserved for those with a solid indication and symptoms. If your heart size is normal and you have no symptoms and pressures in lungs etc. are ok, observation may be warranted for non surgical candidates. That may well change as the years go on and we get more data leading to us being more aggressive with the clip. Also cancer and radiation alone are not necessarily contraindications to repair surgically. In my center, everyone is seen on the same day by the interventionalist/surgeon/imager/anesthesiologist then a team decision is made. Thank you for your reply. I am currently being monitored every 6 months. I do need to go for a second opinion. I’ve read of increased mortality & poor healing in Chest radiation patients, hence my hope in the noninvasive migration, but it doesn’t sound like it will it will be an option for me. (Thanks too for all the well written heart articles on this site- very helpful)! My husband has an IVC filter implanted in 2006 after developing a PE. I do not know what brand of filter was implanted, as the hospital states those records are no longer available. Will he be able to have the Mitraclip procedure done? His PCP, who is a cardiologist, says they will be able to use an intravenous approach OTHER THAN the femoral if there is a problem bypassing the IVC. He has been on Coumadin since 2006, and also, he went into an afib in 2010 during a routine colonoscopy which the PCP chose to resolve with Betapace, rather than an immediate cardioversion. The Betapace was useless and 3 months later, the PCP ordered a cardioversion which was NOT successful–therefore–chronic afib. He is to see Dr. Lasorda at AGH in Pittsburgh for this procedure. I’ve done Mitraclip procedures through IVC filters where necessary. Its of course not ideal but technically can be done when necessary. It should only be done by those familiar with its technicalities and able to troubleshoot potential complications. If there is no thrombus through the filter then the key is to carefully negotiate through it without dislodging it. There have been cases of chronic thrombus that needed adressing to allow the Mitraclip guide catheter through it, of course this is technically challenging. The filter should be imaged before hand and these factors known ahead of time. Would you consider posterior leaflet flail on the mitral a good candidate for mitraclip? Would a patient with severe mitral and severy tricuspid insufficiency, pulmonary hypertension and cirrhosis (but good liver and kidney labs) be a clip candidate or better go for mitral replacement and ring on tricuspid? I consider posterior leaflet flails the most technically straightforward. The conditions you report make it sound like you would be a good candidate, I’m not sure of your age, the extent of your pulmonary hypertension, or other comorbidities however. I have left mitral valve regurgitation, pulmonary hypertension, and cardio myopathy. My symptoms are shortness of breathe, fatigue and heart palpitations. Would I be a good candidate for mitral valve repair? How leaky is the valve and why is it leaky? Do you have a copy of the echocardiogram report? Patient Age – 66 yrs / Male, history of high BP – on medication for High BP for 10-12 yrs. Echocardiography showed – Left atrium was of mildly dilated size. Else everything showed normal. Echocardiogram impression – Estimated Ejection Fraction = 60% & Mitral Annular Calcification seen. Dr suggested for EPS+RFA…Request to provide your opinion…it is imp for me to know from you..
Have you worn a monitor to see if there are underlying arrhythmic events. If so what did they see? Same patient as above – Hemant Udeshi – One more symptom to add is – Palpitation since 6-7 yrs Intermittent. I have a handicapped daughter who needs to have a leaky mitral valve replaced. She has Seckle syndrome, has mental retardation, autism, ataxia ,ADHD, gerd, behavioral issues, and is over weight. Her cardiologist said he would not consider her for open heart surgery,partly because of all her problems but also because of her ability to understand the recovery process and the rehab that would be required. They are evaluating the possibility of her having the cardio clip. I would like your thoughts on all this. They have also talked of controlling it with meds and keeping her as comfortable as possible and just buy her some time. Thank you. I can speak from my own experience having done a great deal many clips. If done correctly in experienced hands it is a safe procedure with minimal rehab issues. I typically send patients home the next day. I would need to see the echo to comment specifically on the suitability and technical feasibility of the clip. If she is not felt a surgical candidate, and she has severe MR with suitable anatomy, the clip may present a good option. Thank you for all the information you have posted. My 50 yr.old handicapped daughter needs a mitral valve replacement. Her cardiologist doesn’t think she would be a candidate for open heart surgery, and has mentioned the mitra clip procedure. He is consulting with a specialist who does that procedure to see if he thinks she would be a candidate for that, or if he should just medicate for it. She has Seckles syndrome and has numerous problems which include: mental retardation, with an overall iq of about 68. She has autism, adhd, ataxia, gerd, behavior disorders, gastropresis (sorry about that spelling). I would appreciate your thoughts on this, as we have a big decision to make real soon. Thank you for this information. My mother is 85 and had a CABG surgery 2012. She currently has dyspnea, extremity swelling, atrial fibrillation, and fatigue. She also appears to have more mental confusion. The cardio said she has severe mitral valve regurgitation and is scheduling her for TEE and cardiac cath with the potential for the clipping procedure. She does have pulmonary hypertension as well. What will determine at the time of the procedure whether she is a candidate for this? She probably would not withstand another CABG although without intervention she will probably continue going down a path where she won’t be able to get enough oxygenation. I see a lot of patients sent for consideration Mitraclip and approach it in the following way. 1) Is there severe mitral regurgitation. As a valve specialist, i can tell you this is not always as clear cut as people think. The valve needs to be assessed closely and the anatomy of the valve needs to be suitable for the Mitraclip. 2) Are the symptoms attributable to the mitral regurgitation. If mitral regurgitation is confirmed its important to realize we are talking about a population often in their 80’s and 90’s, the evidence upon which many of our decisions are based to not apply to this population. I need to be convinced not only that the patient has severe mitral regurgitation, but also that the symptoms are attributable to this. Patients sent for the clip often have a number of other conditions and its important to tease out the contribution of each. One of the mistakes i see commonly made is people trying to clip people who simply need to be left alone rather than undergo a procedure that may not be the answer in that case. In this case, its important to understand the mental confusion. The valve issue may not be related and that needs to be addressed and understood. The procedure can be an excellent solution, IF the mitral regurgitation is felt to be a primary issue in the patients condition. Thank you for your article Dr. Mustafa Ahmed. How do i go about finding an interventional cardiologist that specializes in structural heart disease? My mother lives in Arizona in the Phoenix – Scottsdale area. Also the reply above was especially helpful. I often feel frustrated that I am not getting clear cut answers as to what is happening with my mom. Now I understand that several conditions may exist simultaneously. Im not sure of the landscape of structural heart in Arizona. If it is the clip specifically or the mitral valve you are seeking opinion I’m sure our group would be happy to review the records and if you are feeling you aren’t getting answers you need it may well be worth a trip. Great article – TYVM for sharing! I am an 85 yr old female, I started 15 yrs ago with mild regurgitation in aortic and mitral valves. Worsened as years passed until I had MVP. I now have SSS, AFib, AFlutter, PH, and HF. Had a PM inserted in 2014. Had an ablation for the AFlutter in 2016. Everything continues to get worse with each passing year. I’m wondering if I would be a good candidate for the MitraClib procedure? I am 5’2″ and 125 lbs, I’m on warfarin and have had no problem staying in range. I am, or used to be, very active for my age and in good health other then the above noted heart problems (which are hereditary). If you have severe mitral regurgitation, and evidence of valve degeneration, then in your case mitraclip may be an excellent option. Does the clip ever become loose or even drop off the mitral valve…and if so, what then? Is it retrievable or does it embolize? The clip coming off and embolizing is theoretically possible if not deployed correctly but is not a real concern and would be remarkably rare. If it did embolize then retrieval may be possible depending on where it ended up. Retrieval would be likely intravascular using snares and such. In reality, experience of this is limited to case reports as it is so rare. More of a concern is single leaflet detachment, i have been sent cases of this to fix. This is where the clip remains attached to one of the leaflets but comes of the other and therefore is mobile with the leaflet to which it is attached. This is fixed typically by additional clip placement for stabilization which can be challenging in some cases, but manageable in most cases. Hi Dr. Ahmed. Thank you for this site. It is highly informative. My question is my Dad is 87 years old and a candidate for the clip. All his tests have been good. Yesterday he had the TEE and it showed he has a left ventricle ​flail leaflet. This was his final test before having the clip procedure. Could this prevent him from having the procedure. He is not a candidate for open heart surgery. Thank you! He Gwendolyn, the mitraclip is a very operator dependent procedure in my opinion and so it depends on the expertise of the person performing it. Easier cases can be done by most with good experience whereas the harder cases are more challenging and often not attempted by those with less experience. in the case of a flail, i would need to see the images to comment directly. Some partial flails are actually fairly simple to fix, particularly if in the A2-P2 location of the valve. Large flails with a large flail gap are more challenging and should be attempted in more experienced hands, particularly if commissural. In conclusion, the flail leaflet can be fixed effectively with the clip in the appropriate hands. Some are much more challenging than others. Hi Dr. Ahmed! I have some questions about aftersurgery treatment with Mitralclip. Does a person undergone this operation require a lifelong Warfarin therapy? What should a person take in case of atrial fibrillation with Mitraclip? The procedure itself does not require Warfarin to be taken after. A lot of patients with severe mitral valve disease, particularly those that are elderly have associated atrial fibrillation and are on Warfarin for that reason. Those patients will typically continue Warfarin after the procedure. For patients not on not on warfarin before the procedure, there is not a requirement to take warfarin after. If the clip can not be done (due to calcification) around the valve. What can one expect now? In jeopardy of dying soon? Hi, I have edited the question to preserve your anonymity but great questions and i will address it fully for you. In this case there is a severe leak of the valve and it is not something that has occurred overnight, rather it has been present a while. In this case we have a patient in their 90’s who is generally functional. The presenting symptoms were not shortness of breath or classic heart failure symptoms, rather they were coughing up blood. The leak of the mitral valve is severe however due to the way the valve is degenerated the procedure would be complex. I probably do amongst the most complex clip cases, and i have a good feel for those procedures that would be straightforward and those that would be very challenging, which allows for intelligent case selection and discussion. The worst thing we could do in this setting is make things worse. In valve that are this heavily calcified, there is a small chance of not only being unsuccessful but making the leak worse and worsening symptoms. The age means that emergency surgery back up is not a good option and so the threshold to be aggressive in a complex procedure needs to be considered carefully. Particularly in the case where the predominant symptoms are not swelling, shortness of breath etc. My advice in this case was to go home, see how he does with walking around and doing his usual activities then reevaluating. If he is unable to do activities that allow a decent quality of life, we feel more justified in proceeding, and to my way of thinking would certainly be willing to attempt it. If however, he is able to live a good quality of life then i don’t feel the procedure in this setting would be justified. The leak has been there a long time and there is no reason to think he would deteriorate suddenly. On June 16th, you performed MitraClip placement on my uncle, who suffered from a severe MI the Monday before. I just wanted to let you know how much my family and I appreciate your efforts with this procedure in particular and your decision to undertake his case, as I now understand how different his condition was in comparison with your other candidates for the MitraClip. It is my sincerest hope that he make a full and prosperous recovery, not only so that my family and I can enjoy having him with us longer, but also so that the success of his case may open the door for others in such critical condition to have the MitraClip as an option. Thank you so much for your efforts. May God bless you and your practice on medicine always. I understand there is an alternative method of Mitral Valve repair ….Memo 3D Rechord Annuloplasty Ring System….it is FDA approved but is a different concept from the MitraClip… and I wonder what your experience, or assessment is, of this different procedure. My understanding is that it simplifies chordal reconstruction and replacement. Also, are the rings used for both Mitral and Tricuspid valve repair? I am a 84 year old, active and totally mobile,….in good health…other than my heart valves….I would appreciate your comments! The re-chord system is a surgical and not a non-surgical approach and is a method of placing chords in surgical mitral valve repair that is standard. The mitraclip is a percutaneous method that does not involve open surgery. Rings are used for both tricuspid and mitral repair. At the age of 84, the mitraclip may well be a better option if you are a candidate and the valve anatomy is amenable. I would seek an opinion at a center where both options are available to a high level and can be discussed. Dotors in UAE advised me to do a mitral valve surgery. I’d like to have your openion wether I need the sugery or not. How severe is the MR do you have the full report details, is the valve repairable, do you have symptoms? In order to prevent the heart attack in patients with mitraclip and constant form of atrium fibrillation, is it allowed to take Dabigatran etexilate or Apixapan instead of Warfarin? 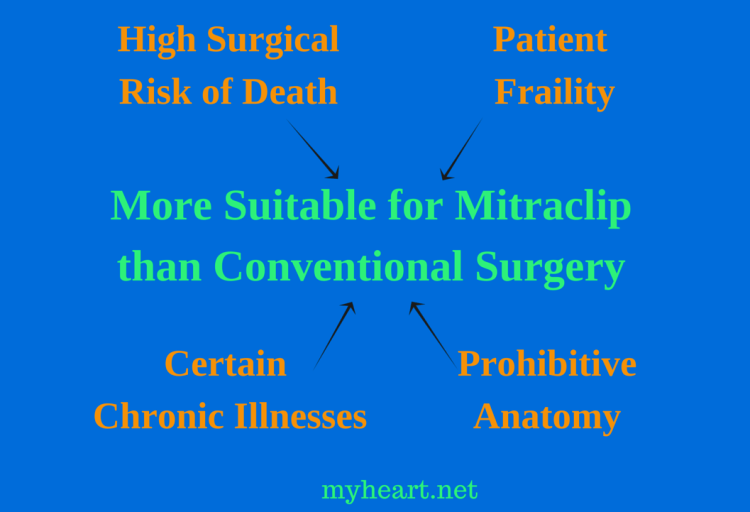 For the mitraclip itself in general we just give aspirin, the anticoagulants that you mentioned are typically used for other reasons such as atrial fibrillation, if that is the case it doesn’t really matter which one is used with regards to the clip itself. I am really grateful for your answer! My mother in law is age 78 . Her cardiothoracic surgeon in Ukraine recommends MitraClip becaue she already had a SAVR operation in 2011 and cannot tolerate another open heart procedure. They can’t do the procedure there. The problem we have is she has no insurance and is an international patient. A well known private clinic in Jacksonville will do the operation but wants over six figures cash – my question is how can we find a medical provider in the southeast for MitraClip in the southeast that doesn’t want the proverbial arm and a leg? We know the clip itself costs in the neighborhood of 30K, so are ready to pay that and more. When we try university hospitals, they just never return our calls, faxes and emails, so we can’t even get a cash quote. Have you got any suggestions how to access treatment? Contact the valve clinic at Princeton Baptist Medical Center, Birmingham, Alabama. Mitraclip should only be done in symptomatic people. In general i perform angiogram in all my clip cases, one of the reasons being its akin to a surgical mitral valve repair procedure, and in the tiny chance surgical back up is required, one would really need to know the coronary anatomy prior to best handle the situation. My mom had the mitraclip done to repair a leaky valve. She was in the hospital a week, has beem back for 2 check ups. On the second check up they said the mitraclip was clipped to much. They are now talking open heart surgery, she is extremely high risk for open heart surgery. 1. is this malpractice, they had her a week and a follow up appointment and not till the second appointment did they catch this? 2 Can another clip be put in or the other fixed? My mother had the mitraclip done. She was kept in the hospital a week due to other reasons. During the week she was in there everything far as the mitraclip was fine. She had a follow up appointment a month later, again everything was fine. She had a second follow up appointment and was told the clip was clipped to much and is not performing as it should…. The nurse(not the doctor) made the comment about open heart surgery. My mother his high risk. Would she be able to have the clip redone or another put in? Would this situation be considered malpractice, considering everything had been fine and now they say it was clipped to much? I would like to get feedback. I of course cannot comment on the specifics of an individual case, the complexity of this is such that is differs very much so on a case by case basis. The critical question here is was the regurgitation severe in the first place, have significant symptoms, and was she prohibitive risk for surgery. If so then there was a good rational to proceed with the mitraclip. The next question is, does she feel better? If so then this is good, the aim has been achieved and there is no concern with a slightly high gradient (tightening per se) of the mitral valve. If the symptoms have worsened and the valve is felt to be too tight then there may be an issue, however further evaluation would be required to clarify. The risk of tightening depends on many factors that can often be identified prior to the case, it is often a balance getting the right amount of reduction in leak while preventing tightening. Tightening is not unheard of and is a known risk of the procedure however depends on factors such as experience and other. I would recommend starting by obtaining a consultation with the evaluating team and characterizing the valve itself prior to making next steps. Options such as surgery, only if required, can be discussed thereafter. I had two mitraclips installed three years ago and a recent echocardio has revealed one side of one clip has pulled away from the mitral leaflet. A trans-esophageal echocardiogram will be able to assess the damage more precisely. Without open heart surgery what, if anything, can be done; I.e., removal, reattachment, placing a new mitraclip, etc.? I have been sent cases similar before. Needs careful assessment of anatomy and prior clip placement before making a decision on whether to proceed. There are potentially re-clip and surgical options depending on this. hi my mother is being evaluated for this procedure ,she has high blood pressure little diabetic frail weak some they have been monitoring her last 7 years she had a heart attack 7 years ago , was doing good last 5 years her aeorta valve was 1.2 for 2 years now .8 they r conciderring this treatment otherwise what will happen to her if they don’t do it? And how long do they live with this clip ? Its difficult to comment on the suitability of the clip without doing a full evaluation, case selection is critical in good results. Depending on the way the clip is placed it can last many years with a durable result. If the aortic valve area is 0.8 has TAVR been considered? My 84 year old mother is on dialysis 3-4 days per week. Her blood pressure continues to drop (in the 80’s today. Jer Mitral valve is completely shot and she struggles to breathe, even thogh she is on oxygen 24 hours/day. She had a stent put in an aortic artery, which the surgeon fef was a better option than addressing the mitral. She cannot undergo andy surgery requiring general anesthesia. She has severe CHF. Would the clip be an option to improve her quality of life? The potential benefit of the clip is determined on a case by case basis and depends on many factors. I would recommend evaluation at an experience clip center.